To request a printed copy of the Guide Dogs for the Blind legacy pack, which includes information on our Free Will service, simply click the order button below and one will be sent to your registered address. “Before Aussie I was scared to go out on my own. But with Aussie I don't need to be scared at all; he looks after me very well.” . Request your Life Changers pack and DVD to receive a fascinating insight into the early life and training of these amazing dogs and how they are shaped into the life-changing companions they become. Did you know that two out of three guide dogs are only made possible thanks to gifts in Wills? Guide Dogs is helping more people than ever before and a gift in your Will could help provide the guide dogs of the future, so that people like Yvonne are never left out of life. By making a gift in your Will through Guide Dogs, you can also benefit from our free wills service, giving you the opportunity to have a simple Will written or updated for free by a solicitor in your local area. 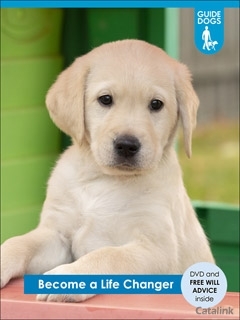 Guide Dogs for the Blind - Life Changer Pack Gordon T. said: all the information needed inbrochure. great products well laid out and well worth purchasing from the guide dogs. Guide Dogs for the Blind - Life Changer Pack Linda B. said: Such a good cause will be buying. Guide Dogs for the Blind - Life Changer Pack Margaret S. said: A cause I am very interested in - I send donations already and am amending my wishes relating to my Will. Guide Dogs for the Blind - Life Changer Pack Robert C. said: i will buy in The future.yours bob Cartwright. Guide Dogs for the Blind - Life Changer Pack Gordon D. said: Great idea! Guide Dogs for the Blind - Life Changer Pack Macaulay J. said: I loved this. I wanted to read more and I was very tempted to adopt a guide dog. I love animals and I love helping people. At this moment in time i can not afford to do this but will definitely be thinking twice in the future. Petcetera etc &#8211; the professionals choice! Petcetera is a supplier of quality dog products. With everything from dryers to collars, theyve got everything you need for your pet to look and feel its best!